Cloudy with a Chance of Meatballs is a 2009 American computer-animated science fiction comedy film produced by Sony Pictures Animation and loosely based on the 1978 children's book of the same name by Judi and Ron Barrett. It was written and directed by Phil Lord and Christopher Miller in their directorial debuts, and stars the voices of Bill Hader, Anna Faris, Bruce Campbell, James Caan, Bobb'e J. Thompson, Andy Samberg, Mr. T, Benjamin Bratt, Neil Patrick Harris, Al Roker, Lauren Graham, and Will Forte. In the film, an aspiring inventor named Flint Lockwood develops a machine that can convert water into food following a series of failed experiments. After the machine begins to develop food storms, Flint must destroy the machine in order to save the world. The film premiered in Los Angeles on September 12, 2009, and was released in the United States on September 18, 2009 by Sony Pictures Releasing under its Columbia Pictures label. It received critical praise and earned over $243 million worldwide on a budget of $100 million. The film has since been expanded into a franchise, with a sequel, Cloudy with a Chance of Meatballs 2, released on September 27, 2013, as well as an animated television series based on the film premiering on Cartoon Network on February 20, 2017. Flint Lockwood is a wannabe-scientist who lives in Swallow Falls, a tiny island in the middle of the Atlantic Ocean that has sardines as the base of its economy. Flint lives with Tim, his widowed technophobic father, and his pet monkey, Steve. Despite Flint's enthusiasm, his inventions, including spray-on shoes, a remote controlled television, hair-un-balding serum, a flying car, a monkey thought translator, and rat birds, all end in failure. One day, Flint invents a machine that transforms water into food, called the "Flint Lockwood Diatonic Super Mutating Dynamic Food Replicator" (FLDSMDFR). Flint turns on the FLDSMDFR in his laboratory, but ends up overloading and subsequently shorting out the house's electrical supply. He then decides to power the machine by hooking it up to a nearby power plant. When he turns the machine back on, it ends up rocketing through town, destroying Sardine Land (a park conceived by the mayor to increase tourism) before ultimately shooting up into the sky. While recovering from his failure, Flint meets Samantha "Sam" Sparks, a weather intern whose big break was ruined thanks to his actions. Their conversation is cut short when rainbow colored clouds float over the town and begin to rain cheeseburgers. The town rejoices in their renewed food choices, and Flint creates a communication device to send orders to the machine and order it to create different types of food. As a result, Swallow Falls (now renamed Chewandswallow) suddenly becomes a successful "food tourism" destination. Everything is going well until the townsfolk start greedily requesting food from Flint's machine. Flint notices that the food is beginning to grow larger in size. Although he is concerned that the food is starting to "over mutate", the now morbidly obese mayor sees it as profitable for him and the city, and guilts Flint into continuing to make food rain. Citizens and worldly tourists in Chewandswallow are blissful until suddenly a large tornado formed of spaghetti and meatballs threatens the town. Flint rushes to his lab to turn the FLDSMDFR off and attempts to send a "kill code" to stop the machine, but the mayor, while trying to stop him by throwing a giant radish at him, accidentally destroys the communication device after ordering a vegas style all-you-can-eat buffet. With Flint unable to control the machine, a massive food storm is created which threatens the world. When Flint's father encourages him to fix the mess, Flint gains self-confidence, places the kill code in a USB flash drive, and builds a new flying car to reach and deactivate the FLDSMDFR, with the aid of Sam, her cameraman Manny, Steve and Brent (namesake of the Baby Brent Sardine cannery). As they approach the machine in the sky, they find that it is now at the core of a giant meatball, where clouds go in the top and a food hurricane comes out the bottom. The machine sends living food to attack them. In the chaos, the flash drive with the kill code flies out of the window. Back at Chewandswallow, the citizens and tourists escape while the last leftovers fall. Mt. Leftovers collapses, causing an avalanche of food that destroys the town. Despite the avalanche ravaging Flint's Lab, Tim manages to re-send the kill code to Flint's cell phone from there. Flint then goes inside the meatball, finds the machine, and connects the phone to a port. To his dismay, Flint discovers that Tim sent him the wrong file by accident, so he is unable to stop the FLDSMDFR. Flint then gets an idea and uses his Spray-On Shoes formula on the machine, causing it to explode. With the machine destroyed, the food storm subsides and everyone is able to return safely to Chewandswallow. Tim finally shows his appreciation for his son and his inventions and Flint and Sam celebrate with a kiss. Meanwhile, the obese mayor is seen stranded in the middle of the sea, having eaten nearly all of his peanut butter and jelly sandwich boat, while muttering that his plans were not well thought out. Bill Hader as Flint Lockwood, a young inventor and Sam's love interest. Max Neuwirth voices his younger self. Anna Faris as Sam Sparks, a weather intern from New York City and Flint's love interest. Neil Patrick Harris as Steve, Flint's pet monkey who can communicate through a speak and spell thought-translating device. James Caan as Tim Lockwood, Flint's technophobic father. Bruce Campbell as Shelbourne, the corrupt and selfish mayor of Swallow Falls. Unhappy with his status as a small time Mayor he sees Flint as his route to greater success. He becomes obese through constant eating. Andy Samberg as Brent "Baby Brent" McHale, an infamous celebrity mascot of Baby Brent's Sardines and Flint's school rival. Bobb'e J. Thompson as Cal Devereaux, Earl's son. Benjamin Bratt as Manny, Sam's Guatemalan cameraman and former doctor, comedian, and pilot. Lauren Graham as Fran Lockwood, Flint's mother who always believed in her son. Will Forte as Joe Towne, a redneck citizen of Chewandswallow who appears on numerous occasions throughout the film. On May 9, 2003, a year after establishment, Sony Pictures Animation announced its first animated slate, including Cloudy with a Chance of Meatballs, a film adaptation of the book of the same name. The Brizzi brothers were brought to direct the film, with Wayne Rice adapting the screenplay. In 2006, it was reported that the film had been helmed by new directors and writers, Phil Lord and Christopher Miller. After a year working on the script, they were fired for story issues and replaced with new writers, who after a year were also fired. Lord and Miller were then re-hired in 2006. The two completely redid the script, this time with the creative input of their crew. The new draft had the protagonist as a failed inventor who wanted to prove himself to his town. The two were almost fired again after Amy Pascal, then-head of Sony Pictures, criticized the film for a lack of story. Although the film succeeded on the comedic front in the animatic stage, Pascal cited the lack of an anchoring relationship in the film as a failure in the story telling. Unable to create new characters and environments to suit the new story demands, the two elevated the character of the tackle shop extra to be the protagonist's father, thereby creating the relationship Pascal had requested. The pair's experience on Cloudy taught them two valuable lessons: the power of creative collaboration and the importance of emotion in a story. On September 18, 2008, Variety announced that Bill Hader and Anna Faris had signed on to voice the two lead characters, with James Caan, Bruce Campbell, Mr. T, Andy Samberg, Neil Patrick Harris, Bobb'e J. Thompson, Benjamin Bratt, Al Roker, Lauren Graham, and Will Forte also in the voice cast. Lord and Miller said later that year that it would be a homage to, and a parody of, disaster films such as Twister, Armageddon, The Core, and The Day After Tomorrow. Cloudy with a Chance of Meatballs is the second film (after Monster House) that was made using the animation rendering software Arnold. Cloudy with a Chance of Meatballs is a soundtrack to the film of the same name, released under Sony Pictures Entertainment on September 15, 2009. The music of the film and this album are both credited to be composed and produced by American composer Mark Mothersbaugh of Devo. 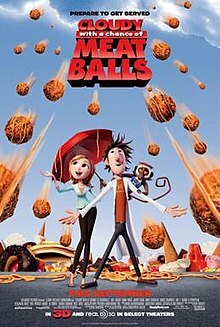 Cloudy with a Chance of Meatballs premiered on September 12, 2009, at the Mann Village Theatre in Los Angeles, California. The film had its wide release on September 18, 2009, along with a digitally re-mastered release to IMAX 3D theatres. The film was released on DVD, Blu-ray Disc, and PSP UMD on January 5, 2010 in the United States and Canada. A 3D Blu-ray was released on June 22, 2010. It was the first 3D Blu-ray sold individually in the United States. Review aggregator Rotten Tomatoes reports that 86% of critics gave positive reviews based on 142 reviews with an average rating of 7.3/10. The consensus statement reads, "Quirky humor, plucky characters and solid slapstick make this family comedy a frenetically tasty time at the movies." Another review aggretator, Metacritic, which normalizes a rating from mainstream critics, gave the film an approval rating of 66 based on 24 reviews. Audiences polled by CinemaScore gave the film an average grade of "A-" on an A+ to F scale. Ernest Hardy of LA Weekly stated the film "is smart, insightful on a host of relationship dynamics, and filled with fast-paced action". Hardy also applauded the 3-D effects which "are wonderful, full of witty sight gags that play out both center-screen and on the periphery". Michael Phillips of the Chicago Tribune gave the film a mixed review stating that "Crazy doesn't always equal funny, and the gigantism of this 3-D offering's second half puts a damper on your enjoyment. But look: This film wasn't made for you, or me. It was made for dangerously, easily distracted 9-year-olds." Kyle Smith of the New York Post gave the film two stars stating that the animated film "greatly expands on the kids' book on which it's based in a clever and engaging first half. But the second half leaves a foul aftertaste." Animator John Kricfalusi, known for his generally negative opinions on modern animation, did a review of the film on his blog, saying that "It was an optimistic portent of what could be. It's basically an undirected film—but one that allowed many of the artists to take nothing scenes and add some kind of cleverness, design and action to the formulaic events being told by the story." Cloudy with a Chance of Meatballs earned a total of $243 million on a reported budget of $100 million. Of the gross, 51%, or $124,870,275, came from the domestic market, while the rest, $118,135,851, from other territories. For the film's marketing, Sony spent $43.3 million in the United States, and $26 million in other countries. The film earned $8,137,358 on its opening Friday, and ranked #1 at the box office with a total of $30.3 million for the first weekend. On its second weekend, it remained at #1 with a decrease of only 17%. It currently holds the record for third-largest opening weekend in the month of September. On October 9, 2014, DHX Media announced that it will develop and produce a television series based on the film franchise, titled Cloudy with a Chance of Meatballs: The Series. The series will be traditionally animated and will consist of twenty-six 22-minute episodes. It will take place before the first film, showing Flint Lockwood as a high school student who dreams of becoming a serious scientist. In his adventures, he will be joined by Sam Sparks, a new girl in town and the school's "wannabe" reporter, along with Flint's dad Tim, Steve the Monkey, Manny as the head of the school's audiovisual club, Earl as a school gym teacher, Brent as a baby wear model, and mayor Shelbourne. DHX Media will handle the global television and non-US home entertainment distribution, along with worldwide merchandising rights, while Sony will distribute home entertainment in the US. Commissioned by Teletoon in Canada, the series will air on Cartoon Network in the United States, and on the Boomerang channel in other territories. ^ "Cloudy with a Chance of Meatballs". The Numbers. Retrieved February 13, 2019. ^ a b c "Cloudy with a Chance of Meatballs (2009)". AFI Catalog of Feature Films. Retrieved November 11, 2017. ^ a b "L.A. Premiere of 'Cloudy With a Chance of Meatballs'/". Hollywood.com. September 12, 2009. Retrieved January 14, 2017. ^ TEDx Talks (October 11, 2012). "Rewriting Collective Insights: Phil Lord at TEDxCoconutGrove". YouTube. Retrieved September 20, 2018. ^ Sloan, Sam (August 16, 2006). "It's Raining.........Food?". Slice of SciFi. Retrieved November 25, 2010. ^ Bharwani, Asim (July 2009). "Sneak Peek: 'Cloudy with a Chance of Meatballs'". MovingPicturesMagazine.com. Archived from the original on 2009-07-30. Retrieved July 23, 2009. ^ IMAX Corporation (July 29, 2009). "Sony Pictures Animation's Cloudy With A Chance of Meatballs to be released in IMAX(R) 3D". PR Newswire. Retrieved January 14, 2017. ^ Kaufman, Amy (September 29, 2013). "'Cloudy With a Chance of Meatballs 2' is No. 1 on crowded weekend". Los Angeles Times. Retrieved October 14, 2017. Both installments received an average grade of A-, according to market research firm CinemaScore. ^ Litt, Stefan (November 26, 2013). "Smurfs 3". WikiLeaks. Archived from the original on August 20, 2015. Retrieved August 20, 2015. ^ Gray, Brandon (September 21, 2009). "Weekend Report: Moviegoers Feast on 'Meatballs,' Slim Pickings for 'Jennifer'". Box Office Mojo. Retrieved September 28, 2012. ^ Gray, Brandon (September 28, 2009). "Weekend Report: Blue Skies for 'Cloudy,' Hazy Starts for 'Surrogates,' 'Fame'". Box Office Mojo. Retrieved September 28, 2012. ^ "37th Annual Annie Nominations and Awards Recipients". AnnieAwards.org. Archived from the original on August 15, 2010. Retrieved February 7, 2012. ^ "THE 67TH ANNUAL GOLDEN GLOBE AWARDS NOMINATIONS". GoldenGlobes.org. December 15, 2009. Archived from the original on 2012-07-31. Retrieved February 7, 2012. ^ "8th Annual VES Awards". VisualEffectsSociety.com. Archived from the original on January 18, 2013. Retrieved February 7, 2012. ^ a b c d e "DHX MEDIA AND SONY PICTURES ANIMATION TAKING CLOUDY WITH A CHANCE OF MEATBALLS TO TELEVISION" (Press release). DHX Media. October 9, 2014. Archived from the original on 2014-10-10. Retrieved October 10, 2014. ^ Sony Pictures Animation (June 20, 2016). "Sony Pictures Animation Announces 2017 & 2018 Slate" (Press release). PR Newswire. Retrieved September 25, 2016. ^ DHX Media (October 5, 2015). "DHX Media and Sony Pictures Animation's Cloudy With a Chance of Meatballs TV Series Goes Global" (Press release). PR Newswire. Retrieved October 9, 2015. Wikimedia Commons has media related to Cloudy with a Chance of Meatballs (film).